My pot of keng hua has been sending out blooms again. Around half a dozen around Valentine’s and now just barely two weeks later, 13 blooms, the same number when I got it last August. Friends said this is probably the best 12 bucks I’d ever gonna spend and I cannot disagree. Anyway, I’m making a sweet broth dessert again with these latest blooms and I’d changed the recipe slightly compared to the previous one. There isn’t really a fixed recipe for this. You can just cook with whatever combination of ingredients use in both versions and I’m sure they would taste delicious nonetheless! The ingredient list this time is pretty standard of what one would expect from what we get in our local dessert 清汤 “cheng tng“. 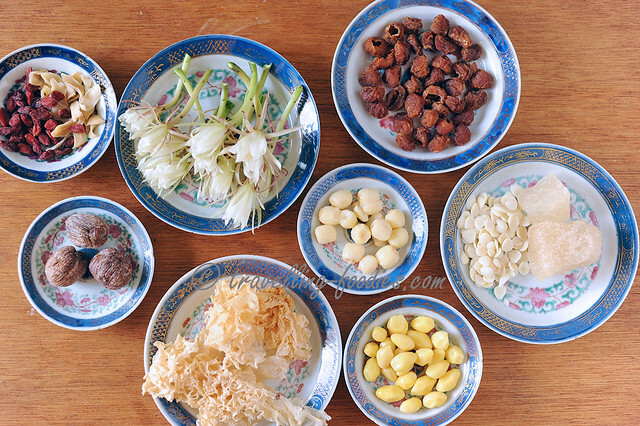 The usual suspects include 莲子 lotus seeds, 白果 gingko nuts, 银耳 white fungus, 百合 lily bud and 桂圆 dried longan. I’d used the Thai version and not the darker caramelised ones from China as the latter would make the soup quite dark. I’d also added 南北杏 apricot kernels, both sweet and bitter variety for their medicinal properties and also aroma, as well as 枸杞 goji berries and 蜜枣 honey dates for their natural sweetness in order to cut down on the amount of rock sugar used. And speaking of natural sweetness, I’d also added red dates and dried persimmon as good substitutes for rock sugar. For the red dates be sure to use pitted ones as the stone makes whatever soup it is cooked in “heaty”. 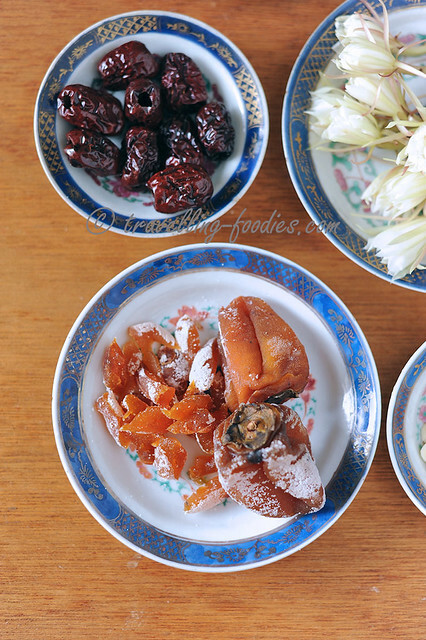 I’d used Japanese variety of dried persimmon instead of our Chinese 柿饼. The former is a lot more expensive but really yummy too. They don’t require much cooking and is added towards the end. 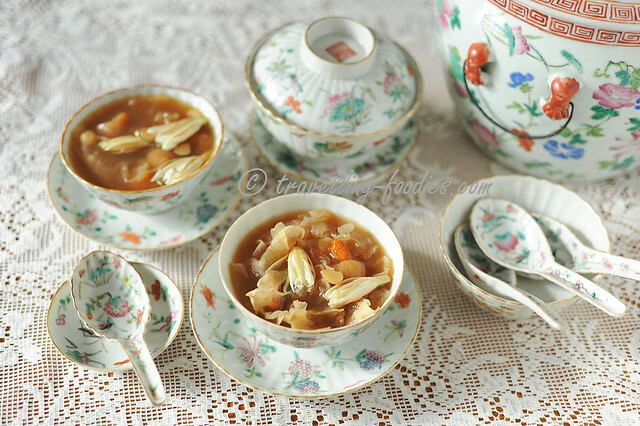 For the recipe, simply follow the one which I’d posted before for 昙花润肺养颜甜汤 Keng Hua Sweet Broth here. 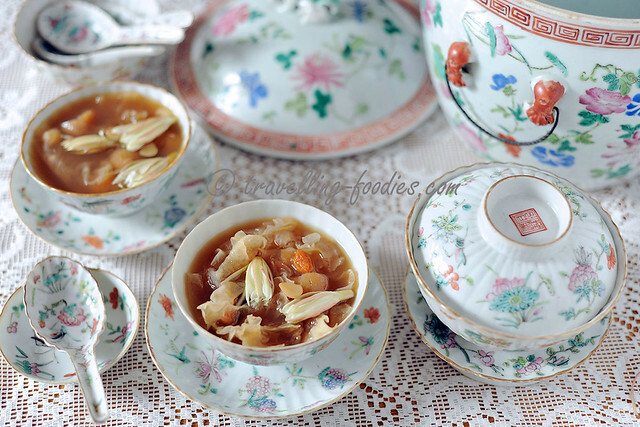 Simply add the additional ingredients like dried longan and apricot kernels together with the rest of the ingredients. Add the dried persimmon, keng hua and goji berries flowers last after turning of the flame. The steeping part is important to allow the flavours to infuse thoroughly. And I prefer to enjoy it cold. 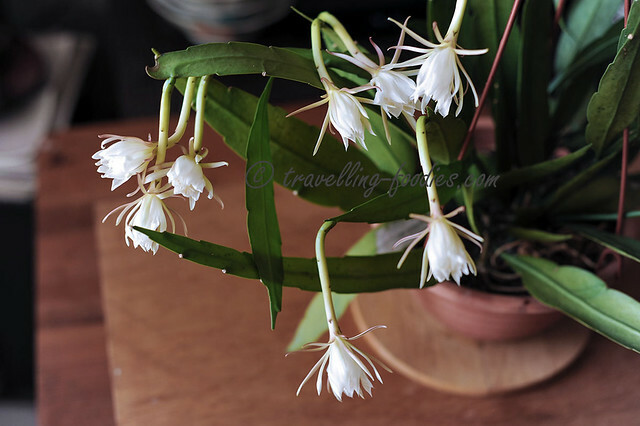 This entry was posted on March 3, 2017 by Alan (travellingfoodies). It was filed under General .